Our good friends Cosmoz are putting on this show at the wonderfully groovy White Out bar in Coco Walk right by Ratchetewi BTS. There are 4 or 5 or maybe 6 bands playing....not sure of the final line up..... There is no entry fee....so there are no excuses! 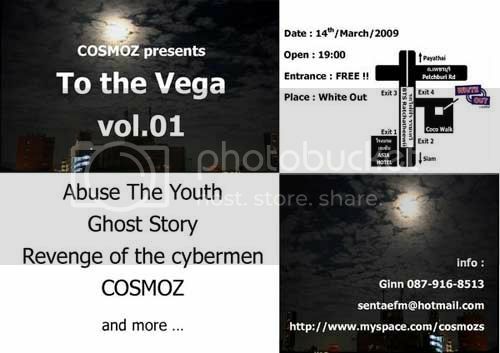 Guaranteed performances by Abuse The Youth, Ghost Story, Revenge Of The Cybermen and Cosmoz and more??!! White Out is great bar with cheap beer and a good performance space..........see you there! !